Al Abdelaziz, flanked by his family, placed his left hand on the Quran and raised his right hand to take the oath of office for the 6th Ward City Council seat at the Hani Awadallah School cafetorium on Monday evening. Mayor Andre Sayegh, his predecessor, swore him into office. Abdelaziz was unanimously appointed by council members to the seat last week. After he was sworn in, Abdelaziz delivered an 11-minute speech, thanking council members, vowing to work with his new colleagues, and outlining some of his political positions. “I’ll be a champion for quality of life issues, for public safety, for good government, and sound fiscal decisions,” said Abdelaziz. He recognized he has big shoes to fill by listing the men – former mayor and longtime councilman Thomas Rooney and former state senator and legendary mayor Frank X. Graves – who represented the 6th Ward. Sayegh, his immediate predecessor, was hands on. He conducted patrols of his area at the request of residents, marshalled neighbors to close down problematic nightclubs, and quickly responded to his constituents through phone calls, text messages, and social media. Sayegh delivered services to his constituents even while at loggerheads with then-mayor Jose “Joey” Torres. Calling himself the “mayor of the 6th Ward,” Sayegh did so through a network of officials within the municipal government. “I will honor their legacies not through veneration, but through emulation to continue the progress they started in the 6th Ward,” Abdelaziz told the more than 300 people in the audience. The swearing-in ceremony was packed with officials from the Democratic Party, showing Abdelaziz’s deep ties to the party. Some of Abdelaziz’s critics have said the party made his appointment possible; however, some council members, like Michael Jackson and Ruby Cotton, said their votes were not influenced by the party. Abdelaziz, 30, was appointed to the seat, vacated by Sayegh, last Tuesday, to represent the 6th Ward until a special election is held in November to allow voters to pick their own representative. He will run in the special election for the remainder of Sayegh’s unexpired term, which ends on Jun. 30, 2020. 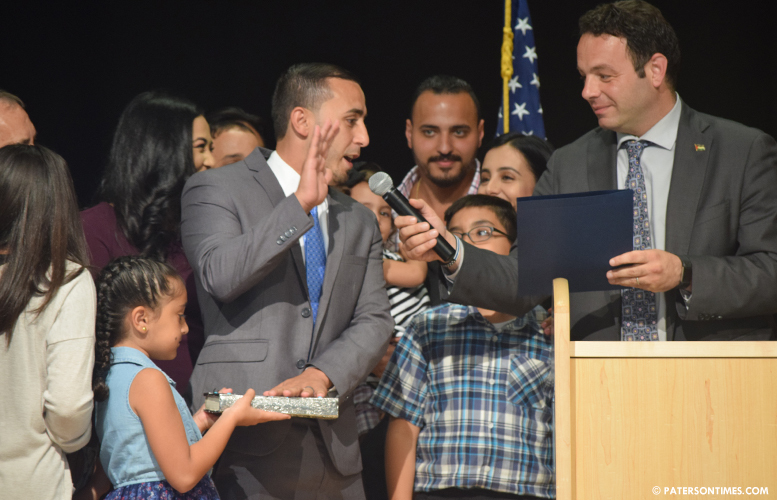 He is the first Palestinian-American to hold a council seat in Paterson’s history. Symbolically, he was sworn in inside a school building named after a Palestinian-American. He is also the youngest person to hold a council seat. Abdelaziz previously ran for the seat in 2016, but lost to Sayegh. Both men were friends prior to 2016, Abdelaziz worked in Sayegh’s campaign in 2014, but their relationship soured during and after the 2016 election. Sayegh and Abdelaziz managed to fully patch up their relationship over the past months. Abdelaziz worked in Sayegh’s campaign that won him a landslide victory. Sayegh supported him for the appointment. Abdelaziz also received the support of some Sayegh critics on the council. He has to tread with care not to offend either side, according to strategists. If he falls out with Sayegh a second time, he could face a big backlash in the 6th Ward, where the mayor is hugely popular and has enormous influence. Abdelaziz works as the Supervisor of Athletics at the Passaic City school district. He makes $120,840 in that role. As a councilman, he will make another $41,200 per year. Abdelaziz vowed to build on Sayegh’s approach to economic development in South Paterson. “For far too long people have said, ‘Anything goes in Paterson.’ If we keep on track with our efforts to spur economic development, make our streets safe, and bring fiscal responsibility to the city, we’ll change that culture from ‘Anything goes in Paterson” to everything grows in Paterson,” said Abdelaziz.